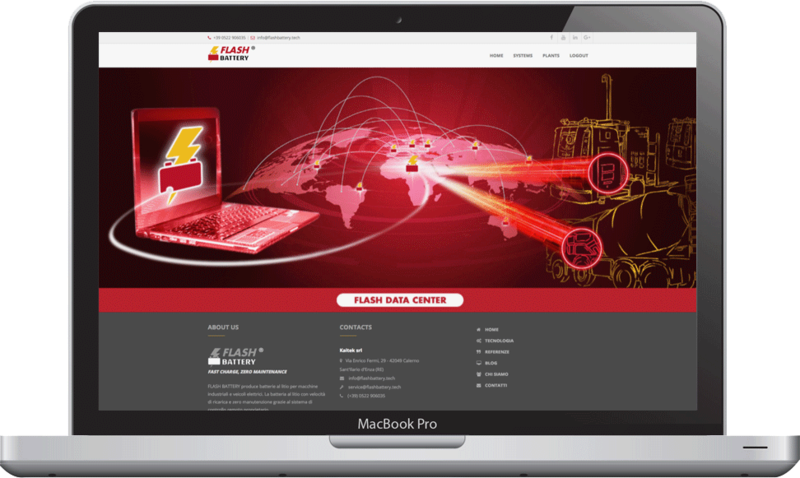 Flash Battery offers higher PERFORMANCE than any other type of battery. Lithium is the lightest metal and the solid element with the lowest density and greatest electrochemical potential, which results in excellent energy performance and low weight. Its extremely high electrochemical potential (willingness to transfer electrons) makes it a powerful component of lithium batteries. A typical lithium ion battery generates 2.4 to 3.7 volts per element, depending on the chemistry used. The first lithium batteries were developed around 1912 by Gilbert N.Lewis, but it was SONY that marketed the first lithium battery in 1990. Today, there are more than 80 different chemicals in a lithium ion battery, which has unique performance metrics (energy density, power density, battery life) and different costs. What chemistry does Flash Battery use? We chose Li-Fe-PO4 chemistry - the safest and most stable on the market. A lithium battery with Li-Fe-PO4 chemistry has a much longer life: more than 3,000 recharge cycles. of small cells in parallel, which lowers stability and can diminish the general safety of the battery pack. Since these batteries are larger, maintenance is performed on-site, and the lithium cells can be replaced easily and quickly. The cells in a lithium battery have different capacities, resistances and self-discharging. This means that when one cell is 100% charged, another may be 95% charged. This difference seems small, but it can increase with each charge cycle until it becomes quite large, which lowers the general range of the battery and the vehicle. 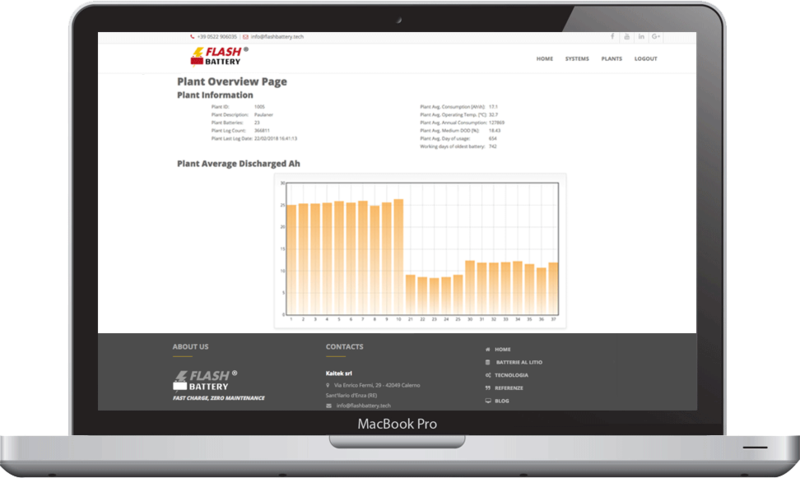 To prevent this loss of efficiency, FLASH BATTERY electronics equalises the charge levels in the cells during charging and discharging. The exclusive Flash Battery electronic balancing system is called the Flash Balancing System. Traditional balancing systems apply resistance to the cells with the greatest charge in an attempt to "lower" them to the level of the lowest cell. This results in 20 times faster balancing without increasing overall recharge time to a significant extent. Traditional balancing systems require a much longer time, so when they're interrupted because the battery needs to be used, the result is a gradual reduction in available energy over time: vehicles and machines thus lose range at every cycle. 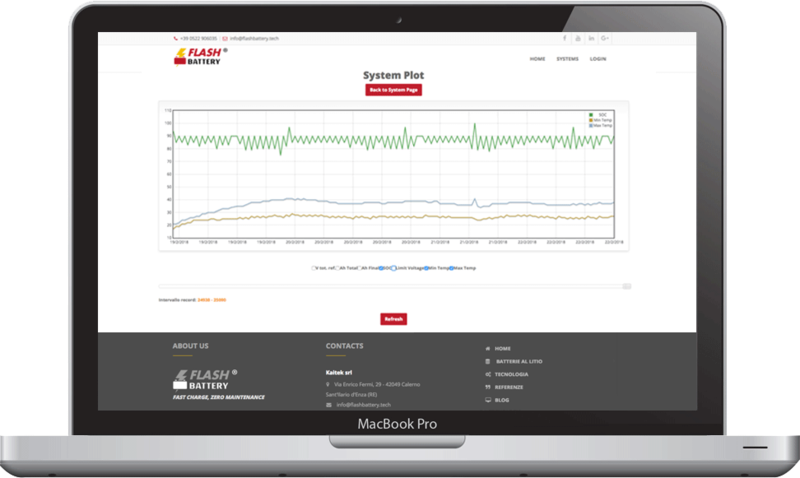 The ultra-fast balancing time offered by the Flash Balancing System during both charging and discharging eliminates this problem and maximises range. 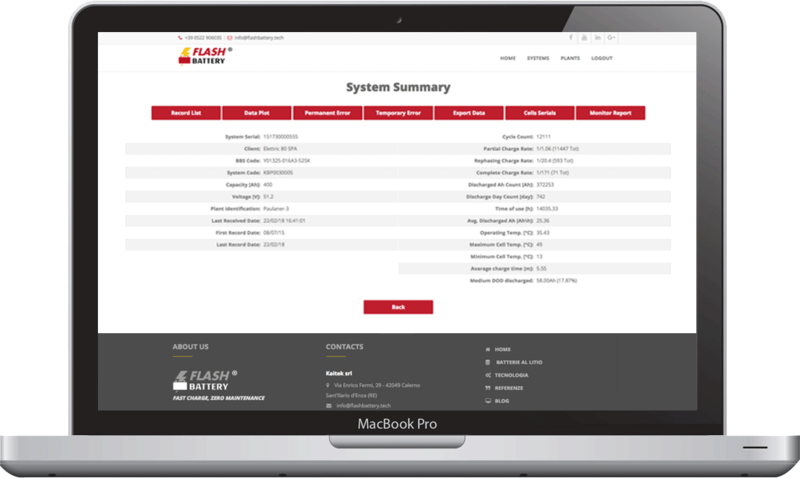 If unexpected repairs are need, the Flash Balancing System makes it possible to add or replace cells throughout the life of the battery, which overcomes the limits of traditional systems in keeping the higher and lower-performing cells balanced. The control electronics in a Flash Battery battery keeps it balanced and efficient from every standpoint. This eliminates the need for regular maintenance, with great savings as compared with other batteries. The battery's internal architecture and combined balancing allow repairs to be made by non-specialised personnel. 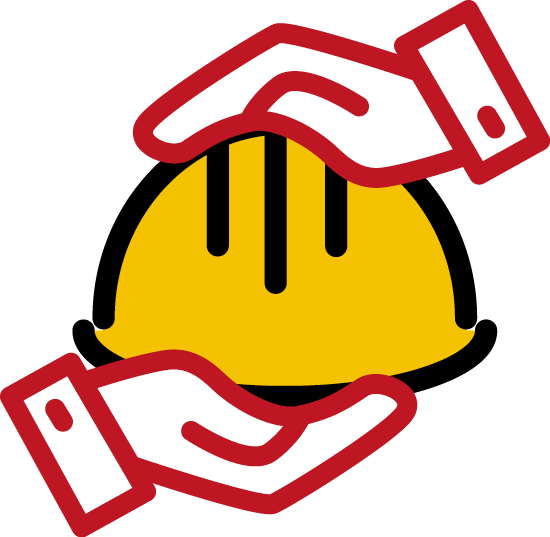 The repairs can be made directly at the user's location, thus avoiding burdensome transport costs and long machine down time. 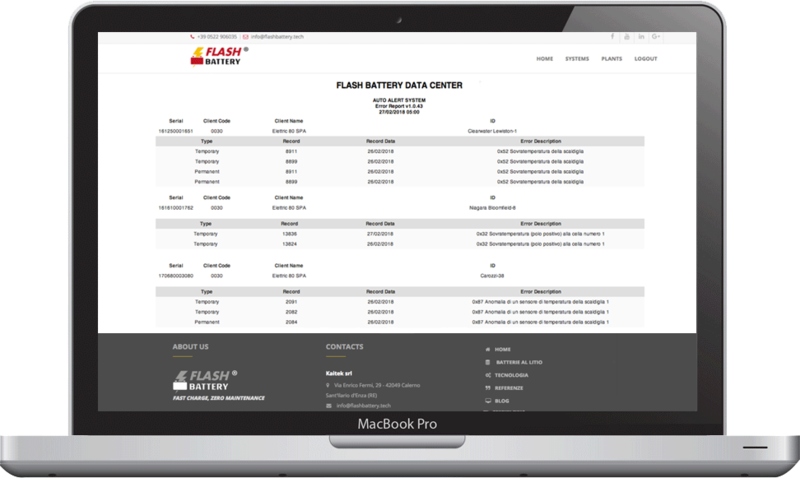 Flash Battery features a remote monitoring system that reports malfunctions on a daily basis and enables the condition of each lithium battery to be determined at any time. Safety is one of the strong points of Flash Battery batteries. We use the safest chemistry available on the market. Even if it's short-circuited, a Flash Battery battery remains safe. 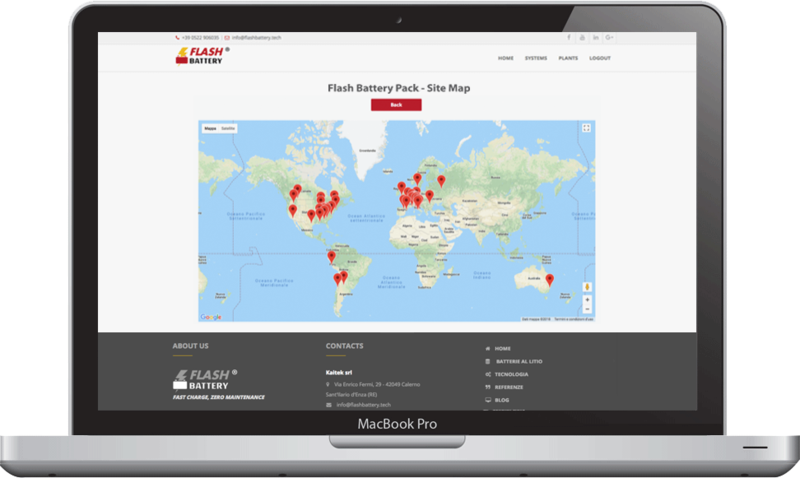 Flash Battery batteries have a safety valve that releases internal electrolyte, at a temperature of less than 80 degrees, in case of malfunction. Flash Battery batteries are equipped with heating and cooling systems to ensure correct operation at temperatures of -30°C to 45°C. which maintains the efficiency and life of the battery at their original levels. specialised technician will get back to you within two business days. FLASH BATTERY produces lithium batteries for industrial machines and electric vehicles. Our lithium batteries recharge in a very short time and require no maintenance, thanks to a proprietary remote control system.